Summary: This wordless picture book chronicles the view outside Tracy’s window from the day she is brought home as a baby to the day she brings her own child home. From the inside of the window you can see that Tracy is growing up, but it is the view outside the window that tells another story. Looking out of the window, a portion of two front yards can be seen. Beyond the fences of those yards is an urban neighborhood in decay. Graffiti, rusted old abandoned cars, empty buildings and robberies can be seen. Inside the fences, however, neighbors are beginning to reclaim the space – gardens are planted, lawns tended. Slowly but surely, the neighborhood begins to change and over the years, the reader sees signs of that change: fresh paint, new stores, children outside playing, a new community garden. Home is seen not just as the building in which you live, but the community within which you share life with many others and the difference that people can make in transforming their communities. Literary elements at work in the story: This story is told entirely in pictures, and the medium is collage. The pictures are extremely rich in color and detail, and you can have a lot of fun looking for the surprising small things both from the inside of the room and outside the window. 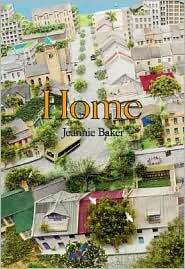 For a book with no words, this book has multiple stories that all tie together to convey the sense of home. How does the perspective on gender/race/culture/economics/ability make a difference in this story? Part of the story that Home tells is that a community is made up of all kinds of people. So you see people of different races and genders throughout the book. And although the community first seen is fairly blighted, the urban space has been reclaimed by the end of the book so one is not left with the idea that cities are terrible places to live. Theological Conversation Partners: Ezekiel 34:17-18; Psalm 24:1-4; Genesis 2:15; Leviticus 25:23-24; Romans 12; Ephesians 4. This book reflects both the care with which the land/neighborhood is reclaimed, and how communities are formed within a particular space. Passages related to God’s created world and our responsibility for it, and those related to how we live in community can both be used when sharing this book. This book tells many stories through pictures. What are some of the things you learn about the girl who lives in the room with the window looking out on the neighborhood? What are some of the things you learn about Tracy’s neighborhood? Lots of things change in this book. Tracy changes as she grows up. What are some things that change in her neighborhood? Who helps the neighborhood change and how does that happen? How is your neighborhood like Tracy’s? How is it different? What do you do to care for your neighborhood? How do Tracy’s neighbors show that they care about each other? How do you show your neighbors you care about them? God created the world and asked us to care for it. What are some of the ways that you can care for the world? Home by Storypath is licensed under a Creative Commons Attribution-NonCommercial 4.0 International License.